In Deloitte’s 2016 Global CPO Survey 2016 report, 74% of respondents stated cost reduction as their top priority in 2017. Also, 70% of the surveyed procurement executives cited indirect spend as a top focus for controlling and reducing costs. Recent studies have found that indirect spend can account for up to 50% of a company’s purchases, and manufacturers specifically can spend 20% or more of their total revenue on indirect expenditures. It is clear the next profound impact area for procurement professionals is in accessing hidden and unexploited areas of indirect spend. The traditional indirect purchasing model is to consolidate suppliers, negotiate strong discounts, set up an e-procurement or marketplace system (using hosted and “punchout” e-commerce web catalogs) and compel users to purchase from preferred vendors at prenegotiated contractual pricing. This approach is a natural extension of direct supply chain models requiring focus to optimize the full lifecycle of critical suppliers. Organizations have done an excellent job of optimizing direct supply relationships and have turned toward indirect procurement for the next area of incremental savings. In indirect, with large numbers of suppliers and potential suppliers to manage, this optimization becomes difficult. Hosted catalogs are easy to use, but the information is usually updated only periodically. Once supplier contracts are finalized, the products and pricing immediately become stagnant and quickly outdated. With punchout (web) catalogs, users must search one at a time to find the items they are seeking and are exposed to many products not under contract or approved for purchase. This purchasing process is usually clunky and time-consuming, leading to poor user adoption of the procurement system. Employees who are forced to deal with exhausting product searches and outdated information are more likely to get discouraged with the purchasing process. Thus, user commodity purchases are often made from the same vendors (without comparing alternative pricing options) or via “rogue spending,” which are purchases made outside of the ERP or e-procurement system that nullify the benefits of the prenegotiated discount pricing. Both scenarios result in a significant loss of savings. Rather than follow traditional procurement approaches of rationalizing suppliers to drive compliance and efficiency with each relationship, it is much more impactful (and practical) in indirect procurement to optimize across the complete pool of available suppliers by creating a competitive, real-time marketplace. Supplier products and pricing aren’t — and shouldn’t be — static. Suppliers such as Staples, Amazon Business, Dell, Fisher Scientific and thousands more are continually discounting commodity segments and products on a 24/7 basis (even below the best prenegotiated pricing costs). As a result, any one vendor will not be the best choice at every given moment in time. Real-time product/pricing data and alternative supplier choices for end users are essential to deliver significant, untapped savings on indirect and long tail spend. While end users have come to expect this type of online competitive shopping in their personal lives, most e-procurement or procure-to-pay (P2P) software solutions have never been able to truly deliver on the shopping experience or savings promised. Real-time technology makes it possible to rethink the traditional indirect procurement business model and provide users with true comparison shopping within corporate purchasing processes alongside procurement guidance and visibility. Procurement and financial leaders need to evolve the way they think about B2B e-commerce, supplier relationship management, procurement savings and ROI. It is time to realize the indispensable value that real-time data delivers to their organizations and to understand that procurement needs to move at the speed of now. Instead of constraining users to purchase only from one or two large suppliers with stale, prenegotiated pricing, procurement and financial leaders can empower users to become champions for savings at their organizations, by providing visibility to all prices in real time, allowing them to choose the lower-priced options at any specific moment of purchase. Studies indicate that these previously untapped savings can be significant. “Price dispersion is found to be significant and persistent. Baye et al. finds an average coefficient of variation of about 9% for goods being sold online,” says Hopkins. 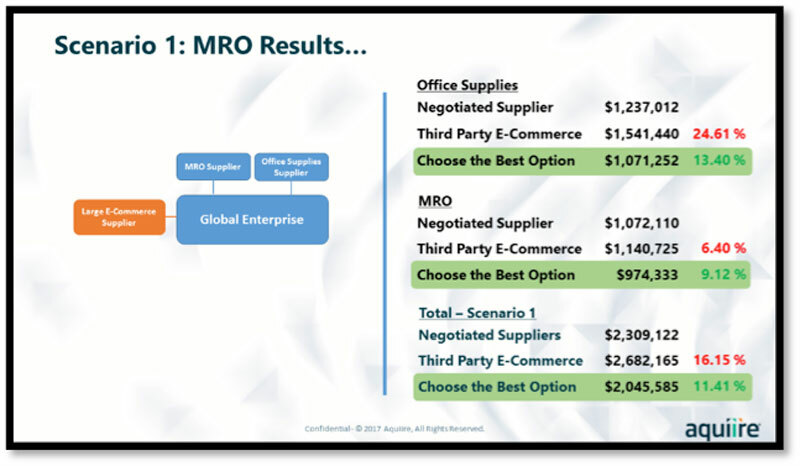 The study compared around 65,000 purchased items made with the client’s negotiated pricing from two of its major suppliers (MRO and office supplies), together with a large e-commerce supplier that also provided the items it purchased. We then calculated the savings the client could have achieved if its buyers selected the lowest-price option between at any given point in time. Our research analysts then compared the savings opportunities when pricing from two of the enterprise’s buying cooperatives was brought into the competitive e-procurement marketplace, along with its two negotiated suppliers and the large e-commerce supplier. We measured the potential savings opportunities if the client’s users had picked the lowest-priced option available at the time of purchase between all five suppliers. 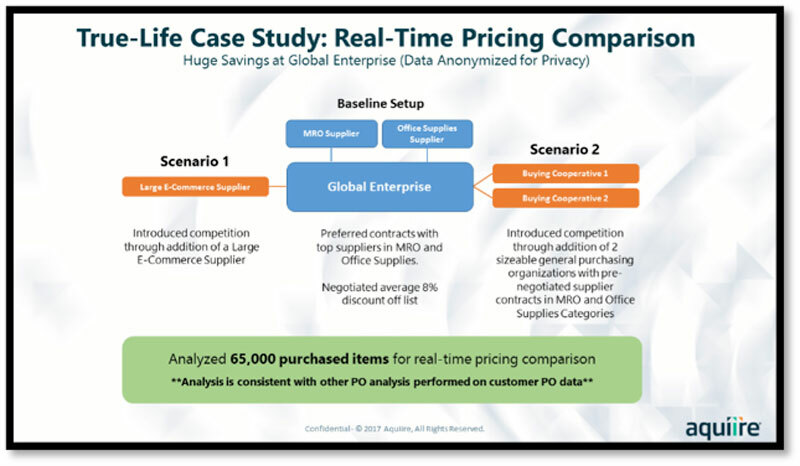 As you can see, if the enterprise users purchased the lowest-priced item in a competitive marketplace environment, the company would have saved $263,537 over its negotiated supplier pricing. And this is just a small sample of the total company spend per year. 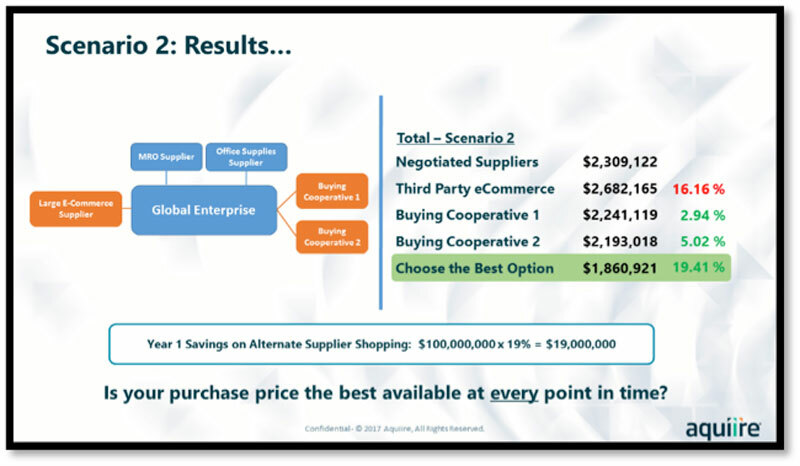 Now let’s look at Scenario 2 total cost results when including products and pricing of two buying cooperatives into the marketplace. These test results show that as more competition and pricing options are brought into the e-procurement marketplace, the higher the savings potential is for the organization when the lowest-priced option is selected at the time of purchase. In this scenario, the enterprise would have saved $448,201 on the 65,000 items purchased. If the enterprise’s annual indirect spend is $100 million, and the organization averaged an additional 19% savings by utilizing the lowest alternative supplier pricing model, that would equate to an annual savings of $19 million. Even if we conservatively predict that overall savings would balance down to theoretical savings predictions of 9%, this organization would have saved $9 million per year by introducing real-time competition into their indirect marketplace. This is worthy of a pat on the back from any CFO or CEO. Not only does real-time pricing allow organizations to measure their true realized savings, but capturing alternative supplier data in real-time is also an invaluable tool during renegotiations with suppliers. This historical data can be used to show suppliers the commodity areas and items where they are not competitive across each moment of end-user purchase. Armed with this information, procurement teams have better tools to prompt suppliers into offering lower pricing and incentives, knowing that they are contending for the sale in a competitive, real-time pricing environment. This will drive even more savings potential on their annual indirect spend. Proper vetting and negotiating aggressive discounts with suppliers is still important part of capturing indirect savings and delivering value for stakeholders. But it is time to evolve the purchasing process to the “speed of now” by enabling real-time price comparisons across a dynamic, competitive marketplace. Utilizing real-time data, comparison shopping, alternative supplier pricing and advanced spend visibility analysis tools, procurement leaders can truly deliver and measure the untapped savings on indirect spend they are bringing to their organizations, as well as the additional value they are providing to their stakeholders. It is time to invite more suppliers to the indirect purchasing opportunity, not less. More information on this topic is available through the prerecorded webinar New Ways to Achieve Unprecedented Savings on Indirect Spend. Does this analysis take into account the added time, security risk, & soft costs invested in a multiple supplier solution? For instance, studies have shown there is an additional cost of $700 – $1,400 for every additional supplier due to SRM costs as well as a cost of $50-$75/invoice processed which can add up to a considerable cost that is not seen on paper. Unproductive time searching for best pricing for all items at any given point in time coupled with increased costs associated with returns, customer service issues, & general product/supplier questions. Is the additional consideration of the cost of 2 – 3 times more deliveries in such model resulting in spiked receiving/handling costs and the invitation of an increase in visitors to an organization’s site (security risk).